Available properties are low in supply across the nation and sell very quickly. You need to be able to move quickly if you hope to acquire rentals. However, you also don’t want to make a mistake in your haste. 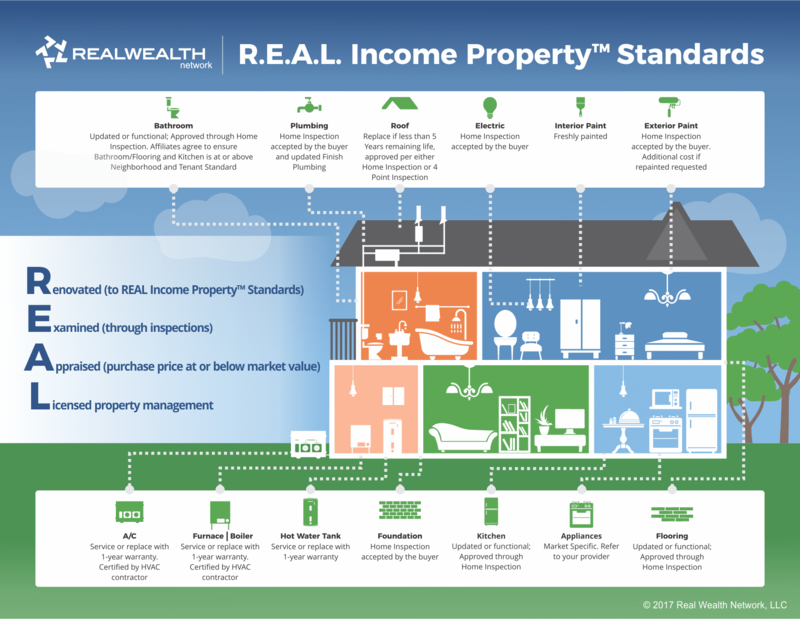 If you’re working with a property team and are considering purchasing a property and that property does not meet our REAL Income Property™ Standards below, please contact your investment counselor. Roof Replace if less than 5 Years remaining life, approved per either Home Inspection or 4 Point Inspection. Furnace Service or replace with 1-year warranty. Certified by HVAC contractor. Boiler Service or replace with 1-year warranty. Certified by HVAC contractor. A/C Service or replace with 1-year warranty. Certified by HVAC contractor. Plumbing Home Inspection accepted by the buyer and updated Finish Plumbing. Hot Water Tank Service or replace with 1-year warranty. Foundation Home Inspection accepted by the buyer. Electric Home Inspection accepted by the buyer. Flooring Updated or functional; Approved through Home Inspection. Kitchen Updated or functional; Approved through Home Inspection. Bathroom Updated or functional; Approved through Home Inspection. Affiliates agree to ensure Bathroom/Flooring and Kitchen is at or above Neighborhood and Tenant Standard. Exterior Paint Home Inspection accepted by the buyer. Additional cost if repainted requested. Appliances Market Specific. Refer to your provider. Property Management Standards Agreed Upon by Affiliates:(Check With Affiliate, some are still in process of making these changes). 1) 1st Tenant = 80% of Monthly Rent (20% discount from National Standard) 2) Lease renewal = 25% of Monthly Rent. 3) Maintenance Warranty – 60 days maintenance warranty. 4) There are no other additional vacancy and maintenance warranties. Our members will be ordering independent inspections. Please provide our members with 3-5 licensed, local inspectors who understand rental property. The expectation is the property meets or exceeds our REAL Standards. If our members are getting traditional financing, they will receive a bank appraisal. If they are paying cash, we recommend a third-party home appraisal. As we all know, property management is the most important ingredient for success in long-term real estate investing. Property managers within our Referral network must be properly insured, licensed according to their state laws and recommended at least 2 years’ experience with a great track record, and use professional management software.